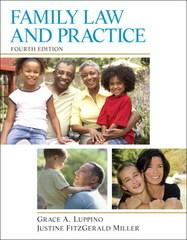 Family Law and Practice 4 Edition Family Law and Practice, Fourth Edition, combines the theoretical and practical aspects of family law, preparing students to enter the workplace thoroughly knowledgeable about both family law and the procedural law requirements of family law practice. An Instructor’s Manual, PowerPoint lecture slides, and a Test Bank accompany this text. Teaching and Learning Experience: Comprehensive coverage that links theory, history, and practice. Interesting, modern cases that reinforce important connections between theory and application. Critical thinking and application of concepts that reinforce knowledge, understanding, and skill development in the area of family law and practice.